Few subjects bring out so well the differences between ourselves and our ancestors as the history of Christian charity. In an increasingly mobile and materialist world, in which culture has grown more national, indeed global, we no longer relate to the lost world of nineteenth-century parish life. Today, we can hardly imagine a voluntary society that boasted millions of religious associations providing essential services, in which the public rarely saw a governmentofficial apart from the post office clerk. Against the background of the welfare state and the collapse of church membership, the very idea of Christian social reform has a quaint, Victorian air about it. In this elegantly written study of shifting British values, Frank Prochaska examines the importance of Christianity as an inspiration for political and social behaviour in the nineteenth century and the forces that undermined both religion and philanthropy in the twentieth. The waning of religion and the growth of government responsibility for social provision were closely intertwined. Prochaska shows how the creation of the modern British state undermined religious belief and customs ofassociational citizenship. 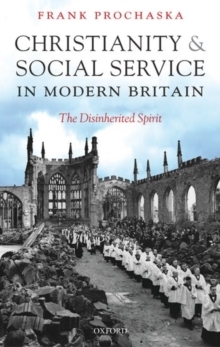 In unravelling some of the complexities in the evolving relationship between voluntarism and the state, the book presents a challenging new interpretation of Christian decline and democratic traditions in Britain.